The Sundance Trio will be at Southern Utah University on Tuesday, April 25, 2017 at 7:30 p.m. in the Thorley Recital Hall. In 2005, Sundance Trio was created for the purpose of performing trios that were written for the oboe, bassoon and piano. 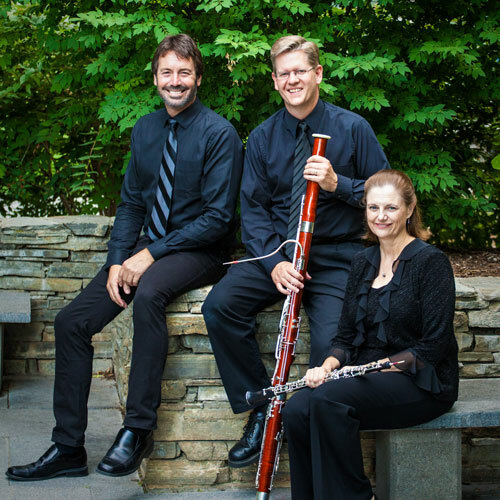 The trio is based out of Northern Utah and members of the trio include oboist Geralyn Giovannetti, bassoonist Christian Smith, and pianist Jed Moss. Music from their repertoire includes pieces composed by Willard Elliot, Richard Faith, Òscar Àlvarez Valero, Francis Poulenc, Simon Sargon, Theodor Burkali, and many more. Admission is free and open to the public. Geralyn Giovannetti, a founding member of Sundance Trio, is Professor of Oboe at Brigham Young University and a member of the faculty ensemble, Orpheus Wind Quintet. She received her DMA degree from the University of Michigan and is also a graduate of the Western University in her native Canada. She has toured extensively throughout the United States, Canada, Europe, Mexico and Brazil. As a member of the award winning Canadian woodwind quintet, Essex Winds, she has recorded three CDs. Dr. Giovannetti has served as a judge for the IDRS Young Artist Competition and for the Asian Double Reed Society Competition. She currently chairs the Young Artist Oboe Competition for the IDRS. Christian Smith is Professor of Bassoon at the BYU School of Music. Beyond his responsibilities with the bassoon studio, he teaches instrumental conducting, directs the woodwind chamber music program, and regularly performs with Orpheus Wind Quintet, the resident faculty wind quintet. An active orchestral musician, Dr. Smith has played under such conductors as Robert Shaw, Raymond Leppard, John Williams, Joseph Silverstein, Maxim Shostakovich, Keith Lockhart, Craig Jessop, and Mack Wilberg. Likewise, he has performed with the Utah Symphony, Utah Opera, Ballet West Orchestra, Toledo Symphony, Ann Arbor Symphony, Flint (Michigan) Symphony, Michigan Chamber Players, Utah Chamber Artists, Colors of the Baroque, and the Canyon Winds woodwind quintet. Currently he is principal bassoonist with the Orchestra at Temple Square in Salt Lake City. Jed Moss is a prolific performer who has appeared on the Columbia Artists’ Community concert series, the Utah Arts Council Performing Arts Tour, the Mendelssohn Society of Chicago series, the Nova Concert series, the Canyonlands New Music series, the Abravanel Distinguished Visiting Composers series and the Contemporary Music Consortium of Utah. Moss has toured in Austria and Germany as a soloist with Utah’s Repertory Dance Theater. As a collaborative pianist, he has performed with musicians from the nation’s top orchestras, including the Los Angeles Philharmonic and the New York Philharmonic. Moss performs frequently on faculty recitals at Brigham Young University, Utah Valley University and the University of Utah, and has made guest appearances in partnership with various artists at Colleges and Universities in Washington, Oregon, Idaho, Nevada, California, Colorado, Texas, Ohio, Illinois, Kansas, Missouri, Maryland, New York and Washington D.C. Moss was a member of the Paradigm Trio for six years, and is now the pianist for the Sundance Trio, performing and recording newly commissioned works for oboe, bassoon and piano. Delight in the sound of this unique concert. For more information on SUU’s Music Department, please visit www.suu.edu/pva/music.